Nothing brings down a trip to Greece faster than having to drag around a heavy luggage under the hot sun. Make sure you pack lightly for your Greek holidays as you will most probably carry your luggage in and out the Greek ferries and along the long paved paths of the villages, where cars are not allowed to enter. 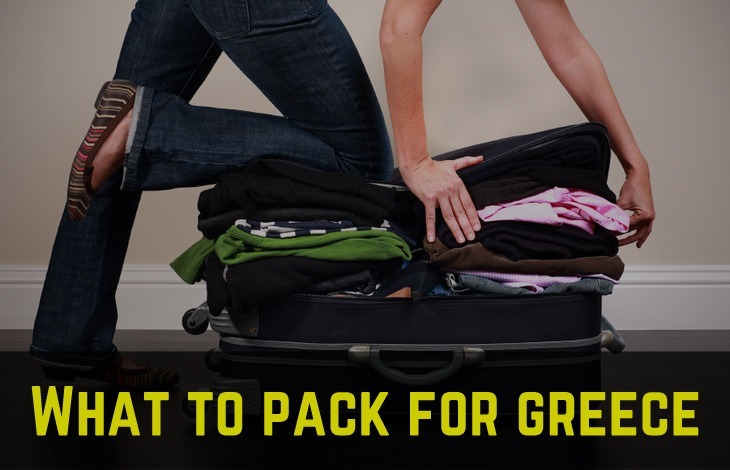 Here are some tips on what to pack for Greece during summer season (May to September), when days are hot and evenings can be a bit chilly (but not too chilly). No need to carry heavyweight pants and long jeans during your summer holidays in Greece. Day temperature from June to August is about 30-32oC, therefore you will mostly need 2 pair of shorts and 4-5 T-shirts or sleeveless tops. Ladies can also bring 1-2 long skirts or dresses. For the chilly evenings, bring a light sweater or a cardigan. A very useful item for the ladies is the versatile sarong. The sarong can serve as a top, a skirt, or a long dress. It can even serve as a warm blanket or a beach towel. Plus it is very light and easy to pack. Do not overdo it with the quantity of clothes. You will be surprised to actually discover that you will not need many of the stuff in your suitcase. After all, if you find yourself missing something very valuable, you can buy it in Greece. There are many low-budget shops in the islands. We suggest you pack 2-3 bathing suits during your holidays in the Greek islands. You may be changing beaches a lot within a day plus some suits may not dry overnight if islands with high humidity (like Corfu, for example). Unless you are going mountaineering or hiking, leave your heavy boots at home. You will not need socks, either. Just bring a pair of sandals and 1-2 pairs of flip flops. You will probably find yourself going around with a pair of flip flops from early in the morning until late in the afternoon. Ladies are also suggested not to bring their high heels to walk in the paved paths of the Cyclades. Your sandals will do for a night out! Your camera (and memory stick) is a very important thing to pack for Greece. If your country has 110V electricity, you will also need plug adaptor for your devices as Greece has 220V electricity. Make sure you also bring your medication if you are taking any, because drugs can be different from country to country. Regarding towels, Greek hotels and studios provide bath towels, which are usually not permitted to be taken at the beach or the pool. Therefore, you will have to bring your own beach towel. Hotels and studios also provide small shampoos and shower gels, but not hair-conditioners. Most hotels also have hair dryers at the bathroom. Your beach bag and sun lotion (better 30 SPF or more) are also essential items for Greece.